Against the backdrop of a shiny blue Earth, two Expedition 50 crewmembers used their hands and a robotic arm to perform maintenance on the International Space Station, and a new video captured a stunning astronaut's-eye view of the spacewalk. The European Space Agency recently posted the high-definition video from the Jan. 13 spacewalk. It shows French astronaut Thomas Pesquet and NASA astronaut Shane Kimbrough (with red stripes on his suit) upgrading the space station's power. The two astronauts were outside the space station for more than 6 hours while they installed lithium-ion batteries and adapter plates. In between close-up views of the astronauts' work, the video occasionally shows glimpses of Earth below. At one point, the Dextre robot, a space station attachment that does refueling tests and other tasks, comes into view. The video also shows the challenges of working in microgravity. In one clip, the floating end of a cable hits Pesquet in the face. 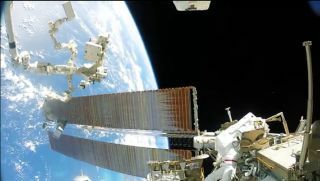 Another clip shows Pesquet carefully crawling along the side of the space station, with a dizzying view of the station's solar panels and the Earth below. The spacewalk was Pesquet's first and Kimbrough's fourth. Earlier in January, Kimbrough and NASA's Peggy Whitson took another spacewalk to upgrade the power, including hooking up electrical connections and installing adapter plates for three of the six new lithium-ion batteries. Follow Elizabeth Howell @howellspace, or Space.com @Spacedotcom. We're also on FacebookGoogle+. Original article on Space.com.